Use double-acting actuator, make sure the valve torque, steam or non-lubricated medium security value 25%; non-lubricated dry air rings increased by 60% security value; non-lubricated gas transmission medium to increase the powder particles 100% security value; for clean, non-friction lubricating medium increased by 20% security value, then the gas supply pressure of work, look for double-acting torque table, get accurate GTD model, such as: Air pressure is only 5bar, control a need for torque 400N.m ball, the medium of non-lubricated steam, taking into account safety factors, an increase of 25% is equal to 500N.m, first find the air pressure according to table 5bar, then look along the vertical column is equal or similar torque data, the election 591N.m, and then along the line to the left to find the model, select GTD160 type. Single-acting actuator, make sure the valve torque, steam or non-lubricated ring 25% security value; non-lubricated dry gas media to increase 60% security value; non-lubricated gas transmission medium to increase the powder particles 100% security value; for clean, non-friction lubricating medium increased by 20% security value, and then find the single-acting torque table, first check the end of spring, and then check the end of the working pressure gas source, gas supply pressure should be large torque in the spring torque, can be accurate until the GTE model, such as: Air pressure is only 4bar, a need to control the torque 180N.m butterfly valve, the medium of non-lubricated dry gas, taking into account safety factors, an increase of 60% is equal to 288N . m, first find the spring by the end of the table to be similar torque 305N.m, then along the column line to the left to find the start of gas supply pressure 4bar torque 584N.m just gas source pressure is greater than the spring torque, torque, then along the line to the left to find the model, select GTE190 type. 1, double-acting pneumatic actuators: controlling the valve open or closed. 2, single-acting pneumatic actuators: circuit, cut off the gas or failure, automatically close the valve. 3, single solenoid valve: open or close the supply valve, the valve closes when the power or open. 4, double solenoid valve: a valve open when the coil is energized, the other coil is energized the valve is closed, with memory function. 5, back to the hearing: long-distance transmission valve open or closed position of the signal. 6, electrical locator: According to the current signal (4 ~ 20mA) the size of the valve opening (ie, medium flow) to adjust the control. 7, electrical converter: the current signals into pressure signals, and supporting the use of pneumatic positioner. 8, pneumatic positioner: According to the pressure signal (0.02 ~ 0.1Mpa) to control the size of the valve opening, to adjust control. 9, Pneumatic FRL: valve, filter, lubricator. Of the gas source stable, clean and lubricate moving parts. 10, manual institutions: when the electrical, gas cut off or fails, for the operation of the valve opening and closing. 1, GT series pneumatic actuators can be directly connected with the valve, brackets and fittings can also be connected with the valve installation. 2, the installation must ensure that the actuator output shaft and the valve shaft concentricity. 3, conduit fittings machine clean inside, no extra material, dust and oil and so on. 4, solenoid valves, electrical locator, electrical converters, pneumatic positioner, reply, etc. should be instructions for installation and commissioning. 5, pneumatic actuators at both ends of the adjustment screw, you can micro-adjust the valve opening angle, the adjusted sales must be nuts tight. And multiple trial and error. 7, install the solenoid valve pneumatic actuators, debugging should be the first to use the manual button operation (the red button on the solenoid valve) debugging, debugging and then on again. 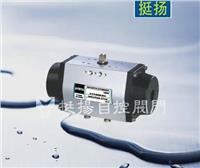 8, the source should be kept dry, clean, regular and actuators compatible with the air filter for drainage, sewage. Under normal use once a month, once a year overhaul.